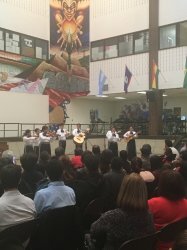 The Pilsen Planning Committee (PPC) had their eleventh annual Pilsen Education Summit on October 21st at Benito Juarez High School. The PPC, along with partnering organizations, puts forth their vision to create this summit including workshops that gives tools in educational, personal, financial, and immigration issues for the families in which they can obtain resources and information for the improvement for the communities. Teresa Fraga who is a retired educator and Treasurer of the Pilsen Neighbors Community Council was one of the speakers representing the Pilsen Quality of Life Plan. The plan includes develop affordable housing, community driven economic stability, ensure educational excellence, preserve and expand arts and culture, and create a safe and healthy community for all. Also, the plan aims to highlight the importance to preserve Mexican and Latino culture in the Pilsen neighborhood. Fraga worked for 29 years as a teacher and parent organizer at Chicago Public Schools which is Orozco Academy. She explains how the Pilsen Education Summit started. “Twelve years ago, feeling frustrated that I took 40 parents to parent power. There were no translations, no Latina role models, the videos they showed at workshops were in English. I was very upset, I was livid because I worked hard to encourage, to organize, sign up the parents with the children and they got nothing out of it. I went directly to the organizers from CPS, this is not good, zero connection with parents. So that’s when I said, we gotta create our own summit, we gotta do it in the way that meets the parents’ needs,” said Fraga. She also mentions the biggest accomplishment they have reached through the summit in all these eleven years. 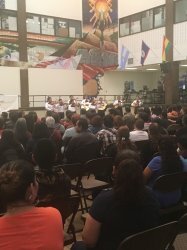 “It should be reflected in the academic growth, that all the schools in Pilsen are level 1 and level 1 plus, there are no level 2, because principals and educators sit in the education table, community based organizations that provide after school programs sit at the planning table and so you have the right people, that’s why we continue till the 11th year,” said Fraga. Marco Garduño has been actively involved throughout all these eleven years trying to reach out to parents and keep them informed through the Pilsen Education Summit. Garduño takes part in hosting workshops for the summit. “In the last 11 years there’s a lot of organizations that have put a lot of work into this from this Pilsen Neighborhood Council, to the school’s, high schools, all these organizations are invested. We really want them to understand that everyone is invested in their education, and the progression and the betterment of their kids, and their family. Even though Pilsen has changed, the organization still wants to make sure that we are providing enough information to their parents so they could improve their quality of life. So I think what I want parents to take out of this, education is not really a school and then once 3 o clock hits, I go home. Education is a part of life,” said Marco Garduño, Supervisor of Academic Advisement and College Retention at Instituto Health Sciences Career Academy. 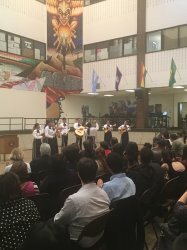 The Pilsen Education Summit also included performances from Chicago Mariachi Project, students’ performance, and Frida’s Perez Rise Folkloric Dance.